Well after the trials and tribulations of recent days I finally found the problem. It was traced to a badly soldered wire on the switch for the narrow gauge point. The switch had come loose on its mounting and when operated it moved sometimes, and two wires touched, causing the short circuit. Having removed the switch from its mounting, re-soldered the two errant wires, everything is working again. Breaths sigh of relief! 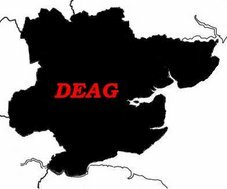 Tomorrow night is DEAG meeting night and I plan to continue to DAS the layout.